The Tempo, Club Car’s newest fleet golf car. 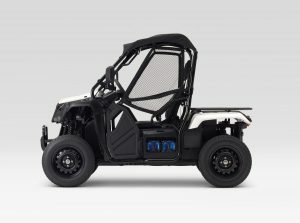 The four-person Club Car Tempo 4Fun fills out the new fleet line. 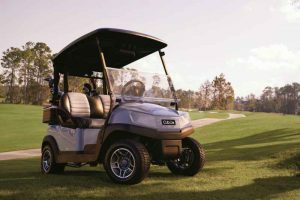 Club Car launched their newest fleet golf cars, the two-person Tempo and four person Tempo 4Fun at last week’s 2018 PGA Merchandise Show in Orlando. The Tempo comes with an all electric or gas drive train while the Tempo 4Fun is only available as an electric. Tempo’s electric drive train features a 3.3 hp motor, 48V power system and a single-point watering system. The Tempo 4Fun has the same system except for a 3.7 hp motor. 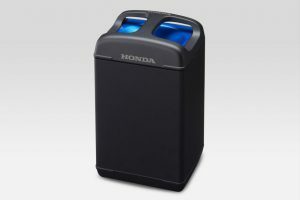 Both features battery packs with six 8-volt batteries. The gas Tempo is powered by a 404cc, 14 hp, single cylinder engine. The touchscreen is part of the Tempo Connect package which includes Visage fleet management and the Shark Experience entertainment bundle. 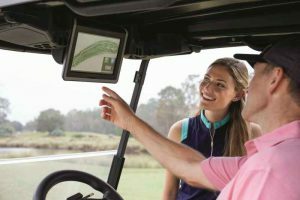 The distinguishing option for the new fleet golf car is Club Car’s Tempo Connect, an electronics and connectivity package which includes speakers and a touchscreen that can display an electronic scorecard, 3-D flyovers, hole overviews, a rangefinder and a GPS messaging system. Tempo Connect includes both the Visage Fleet Management system and the Shark Experience. The latter is an entertainment system developed by Verizon in partnership with Greg Norman that provides golfers with live sports, music and golf tips. Visage has been on the market a number of years and is a fleet management system. 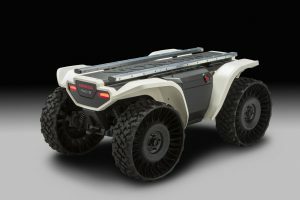 The 2018 Polaris Ranger XP 1000 EPS. 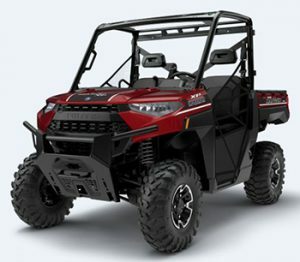 The 2018 Polaris XP 1000 EPS seats three and is powered by a 999cc, 82 hp gas engine with EFI. This model features electronic power steering, High Performance On-Demand AWD/2WD/ VersaTrac Turf Mode, 11″ of front and rear suspension travel, 13″ of ground clearance, a 2,500 lb towing capacity and a 1,000 lb. capacity cargo dump bed with gas assist. This base model is priced at $15,299. Some key improvements over the 2017 model include a stiffer chassis, more suspension travel and ground clearance, increased payload, greater towing capacity, tighter steering system and improved cargo bed. 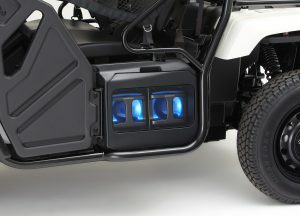 Polaris also offers what might be called a “premium” EPS model for a $1,000 more with several automotive style paint options as well as aluminum Black Xcelerator 2.0 wheels and cut and sew seats. For a further $200 you can have camo graphics. There is also a Northstar Edition for $23,999 which comes with a complete cab with heating and AC. www.utvplanet.ca – Test drive in work and trail environment. Great suspension on a variety of terrain at slower speeds and improved over 2017 model at higher speeds with less body roll. User Forum – Actually a Honda forum but discussed the Ranger XP 1000. Dirt Trax Television – In-depth look video presentation. Mostly a presentation by a Polaris employee but a thorough explanation of the many changes made compared to the 2017 model. The following is a summary of some of the road use regulations for golf cars, LSVs, ATVs and UTVs that have been passed or are being considered at the state, county and city levels in 2017. After Ohio state officials passed a LSV law municipalities in the state are now passing local ordinances. A number of municipalities are considering or now allowing the use of LSVs for taxi services. Many of the regulations being passed or considered involve both golf cars and LSVs as opposed to just LSVs. Some of the regulations being considered or passes involve allowing UTVs, ATVs and/or mini-trucks on public roads. Some municipalities are reviewing ordinances because of various safety concerns related to the use of golf cars, UTVs, etc. Malinta, OH – The village council discussed an ordinance allowing golf cars to be operated on public roads. Bowling Green, OH – The Bowling Green City Council approved an ordinance allowing golf cars to be used on certain low speed city streets with a speed limit of 25 mph or less. The vehicles must be registered and titled, and possess state-mandated safety equipment. Garden City, KS – The Garden City Commission passed an ordinance to allow utility vehicles to operate on certain city streets. A previous ordinance allowing mini-trucks on the streets inadvertently left out utility vehicles. Sanibel-Captiva Island, FL – The City Council denied a permit to allow a business to locate a low-speed vehicle rental service because of a concern over having adequate parking space. Waterloo, IA – The Waterloo City Council will allow the use of side-by-sides in the Riverview Recreation Area’s off-road vehicle park which previously only allowed motorcycles and ATVs. Some citizens were concerned about the mixing of larger vehicles with the smaller motorcycles and ATVs, and the amount of damage the side-by-sides could do to the trails. Toledo, OH – The Toledo City Council approved the use of golf cars and LSVs on designated public streets through the end of 2018. Under the ordinance LSVs can include mini-trucks and UTVs that travel up to 25 mph. 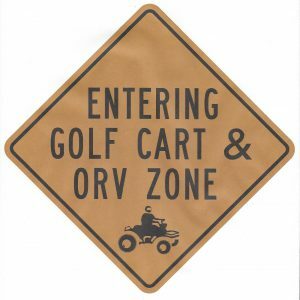 Ormond Beach, FL – County officials posted signage along John Anderson Drive to indicate that golf cars are restricted from using the road. The signage is for unlicensed golf cars as golf cars in the state can be classified as LSVs if they meet certain requirements. Hammock, FL – County commissioners are discussing the issue of golf car use on local roads after numerous residents raised the issue. Residents are concerned about golf cars using bike paths, the ability to cross a state highway to gain access to more roads and the cost of street legal requirements. Elba, AL – Following numerous complaints, the Elba Police Chief had to address the use of unauthorized golf cars and UTVs on public roads. They are allowed on roadways but must meet certain requirements and be registered, and drivers must be at least 16 years old. Auburn, AL – The city council passed an ordinance allowing the use of low speed vehicles to operate as cabs on certain city streets. The council was approached by an entrepreneur who is interested in starting an LSV taxi service. Birmingham, AL – The Birmingham City Council is considering an ordinance that will allow taxi services that use low speed vehicles. The ordinance is based on one from Tuscaloosa where the company Joyride is operating such a service. Bay St. Louis, MS – The city council wants greater enforcement of regulations regarding the use of LSVs, citing underage driving, parking on sidewalks and adults drinking while driving. The golf cars must be street ready and the drivers licensed and insured. Ocean Springs, MS – Ocean Springs is considering an ordinance that will allow the use of golf cars and LSVs on streets with a speed limit of 30 mph or less. Kentucky – A bill was signed that allows the commercial use of LSVs to make deliveries. UPS is planning to use the vehicles during the peak holiday season while the Teamsters Local 89 union, which represents many UPS employees, opposes the move citing lower pay for the LSV drivers and concerns about safety. Jamestown, RI – The city council passed an ordinance that will allow golf cars, UTVs, ATVs and mini-trucks to be used on designated roads. Jamestown, RI – Town officials are considering an ordinance that will allow LSVs on local roads. Southport, NC – The board of alderman are reviewing a golf car ordinance amid concerns about the age of drivers, the use of alcohol while driving, safety requirements and the use of golf cars with four rows of seats. Fort Myers Beach, FL – The city council is considering a permit that will allow, Nickel Ride, a free low speed vehicle taxi service to operate in the town. 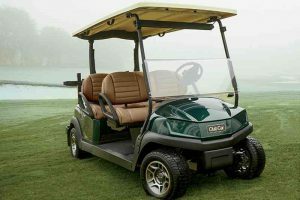 Eustis, FL – Eustis Commisioners are considering an ordinance that will allow golf cars and lows speed vehicles in the downtown area and surrounding neighborhoods. Carolina Beach, NC – The city council passed an ordinance clarifying the use of golf cars on local city streets. The vehicles will not be allowed to cross streets with speed limits above 35 mph and must have seat belts, headlights, taillights, turn signals and a mirror. Highland Village, TX – The Highland Village City Council is looking into allowing golf cars and low speed vehicles to operate on certain local streets. Peachtree City, GA – Peachtree City updated their regulations regarding the authorized use of golf car paths. The update is meant to clarify the rules and allow for better enforcement. Cloquet City, MN – Cloquet City Councilors passed an ordinance that allows the use of ATVs and UTVs on cerrtain local streets. The vehicles need a permit and the driver needs a license or ATV safety certificate.